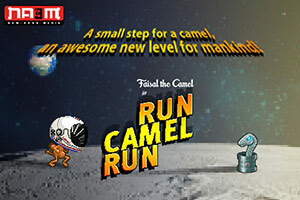 The award winning trans-media incubator, NA3AM (New Arab Media), is pleased to launch the latest version of the popular retro game Run Camel Run. This time, NA3AM is introducing users to new and exciting twists, making the game even more creative and fun. Users of the game are already acquainted with Faisal the camel, as they were introduced to him back in January 2014. They have been a part of Faisal’s journey to find the love of his life, a journey that took them running on the rooftops of Paris and Riyadh. Now, Faisal will be taking his search for love to new heights, becoming the first camel to run on the moon. In addition to Faisal running and jumping across the exciting surroundings, his adventures on the moon showcase a variety of new tools that enhance the user experience: a new space helmet, modern accessories and clothing, dates for longer life, a new gravity free environment and a Facebook leader board that allows people to connect and compete all over the world. Run Camel Run reached high popularity in the Middle East, ranking first in Saudi Arabia in the Arcade games and Adventure games categories. The game also ranked among the top 10 most downloaded Arcade games in 12 different countries within the Middle East (including Saudi Arabia, Jordan, Bahrain, Egypt, Algeria, Oman, Tunisia and Israel). Faisal is young at heart and he loves adventure. We at NA3AM hope that people globally will join in on the fun and help Faisal find his love along this very exciting journey. NA3AM (New Arab Media) is an award-winning transmedia incubator producing and distributing Arab inspired content with global appeal. With a mission to unlock Arab creativity, through social innovation, creative training academies and live events, NA3AM’s multi-faceted platform collaboratively engages its audience from—Arab youth to key influencers across edutainment. Producing mobile games, comic books and educational software, NA3AM provides a safe and open space for unconventional creative expression. NA3AM was founded by His Highness Prince Fahad Al Saud, with a headquarter in Amman (Jordan) and an office in Copenhagen (Denmark).